Alexandra Pellegrino was born in 1958 at Paris, FranceG. She was the daughter of Pierre Pellegrino and Princess Helen Kotchoubey de Beauharnais. She died in 1958 at Paris, FranceG. Princess Hortense Kotchoubey de Beauharnais was born on 2 January 1935 at Paris, FranceG. She is the daughter of Prince Eugene Kotchoubey de Beauharnais and Helen Pearce. She married Gerhard Murjahn on 18 March 1958. Her married name became Murjahn. Gerhard Murjahn married Princess Hortense Kotchoubey de Beauharnais, daughter of Prince Eugene Kotchoubey de Beauharnais and Helen Pearce, on 18 March 1958. Debra Joan Coates was born on 6 October 1960.1 She is the daughter of Robert Coates and Kathleen Ethel Mary Caffery. [S6] G.E. Cokayne; with Vicary Gibbs, H.A. Doubleday, Geoffrey H. White, Duncan Warrand and Lord Howard de Walden, editors, The Complete Peerage of England, Scotland, Ireland, Great Britain and the United Kingdom, Extant, Extinct or Dormant, new ed., 13 volumes in 14 (1910-1959; reprint in 6 volumes, Gloucester, U.K.: Alan Sutton Publishing, 2000), volume I, page 382. Hereinafter cited as The Complete Peerage. 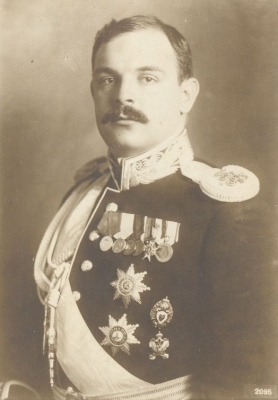 Sergei Herzog von Leuchtenberg was born on 4 July 1890 at Peterhof, RussiaG.1 He was the son of Georgi Maksimilianovich von Leuchtenberg, 6th Duc de Leuchtenberg and Anastasiya Nikolaievna Petrovic-Njegoš, Princess of Montenegro.1 He died on 7 January 1974 at age 83 at Rome, ItalyG. He gained the title of Prince Sergei Romanovskya. Elena Herzogin von Leuchtenberg was born on 3 January 1892 at Nice, FranceG.1 She was the daughter of Georgi Maksimilianovich von Leuchtenberg, 6th Duc de Leuchtenberg and Anastasiya Nikolaievna Petrovic-Njegoš, Princess of Montenegro.1 She married Count Stefan Tyszkiewicz on 18 July 1917 at Yalta, Crimea, RussiaG. She died on 6 February 1971 at age 79 at Rome, ItalyG. She gained the title of Princess Elena Romanovskya. Her married name became Tyszkiewicz.